← Review: Clown Given Thumbs Up by Nerds Unchained! 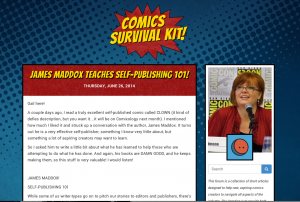 Gail Simone officially launched her Comics Survival Kit on Tumblr! If you’re aspiring comic creator, definitely give this thing a read, and keep up with any new updates. A big thanks to Gail for the opportunity to talk comics, and a big thanks to my comic partner in crime Eric Watkins for putting us in the same room so I could hand her some of my books to read in the first place. This entry was posted in Clown, Comic Reading, Reviews, The Dead, The Horror Show, Writing. Bookmark the permalink.